Pork, chicken, and beef from Bostrom Farms is the foundation of your next great meal. Bring flavor back to your kitchen with carefully chosen seasonings and rubs made with herbs and spices that add savory flair to meatloaf, meatballs, chili, roasts, and your slow-smoked barbecues. 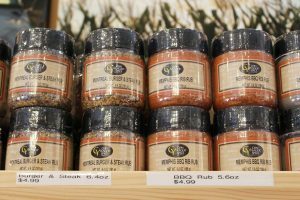 Stop in to our retail store for old favorites and locally made seasonings and rubs. Questions? Ask one of our shop staff!